New York, N.Y.—Journey Girl travel trunk has been voluntarily recalled by Toys-R-Us and the U.S. Consumer Product Safety Commission (CPSC) for laceration hazards posed to consumers by the defective product. The CPSC announced the nationwide product recall on September 27, 2013. The travel trunks were recalled after discovering that the metal handle on the trunk can be sharp, which poses a laceration hazard to consumers. One person reportedly required stitches as a result of the sharp handle. “This recall involves the Journey Girl Travel Trunks used to carry 18-inch-tall toy dolls. 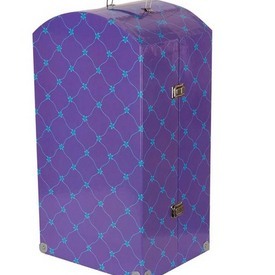 The 21-inch tall curved top trunks are purple with a blue pattern and a blue metal handle. The trunks were sold with three clothes hangers and two pull out drawers for storage. Travel trunks included in the recall have UPC # 4897027965070 and model number 5F5F79E. The model number is printed on the bottom of the travel trunk next to the UPC code,” the CPSC reported. Consumers are advised to return the trunk to a Toys-R-Us store near you for a full refund or store credit. For more information concerning the nationwide product recall, consumers can contact Toys R Us at (800) 869-7787 from 9 a.m. to 11 p.m. ET Monday through Saturday and 10 a.m. to 7 p.m. ET on Sunday or online at www.toysrus.com.